A 36-foot trout dominates Kocina’s zoology mural. Subject matter reflects cultural studies at the Carmichael school. Artist Kocina gave up summer vacations to complete his one-man opus. 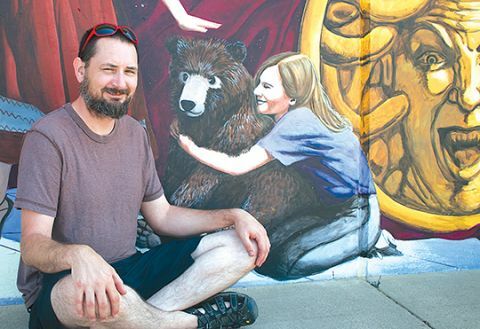 CARMICHAEL, CA (MPG) - A five-summer mission at the California Montessori Project (Carmichael) has festooned the old La Sierra High School campus with five murals. The last was recently unveiled to reveal a dazzling pageant of California history. Explains artist/teacher Noah Kocina: “The work reflects two significant events in our history – the establishment of Spanish missions and the rush to find gold.” Over summer vacations, Fair Oaks resident Kocina completed this and previous tableaux that total 2,500 square feet in area. Reflecting utilitarian 1960s school design, his canvases were originally concrete classroom abutments. Kochina’s designs represent Montessori philosophy and five cultural elements of school studies: botany, zoology, geometry, geography and history. Before he began painting, one lone wall already bore a painted Stars and Stripes. CRPD administrators okayed his murals as long as the nation’s symbol remained. “We were fine with that,” says Kocina. “But I wanted the flag grander and larger. I incorporated it in my geometry mural – there’s a lot of geometry in the design of a flag.” His botany mural centers around a huge California poppy. A 36-foot trout dominates his zoology design. The muralist’s big view of geography shows the solar system in relationship to Planet Earth. He plans a separate future work illustrating native American life before missionaries and miners arrived. To view the Montessori murals, park at 5330 Gibbons Drive, Carmichael and enter playing fields via fence gates. Learn more about Noah Kocina’s art on Instagram at n_kocina.